Just as sustainability in architecture prides itself on blending form and function, it’s important to focus on using interior design elements that not only look great, but also are well made and minimize the impact to our ecosystem. 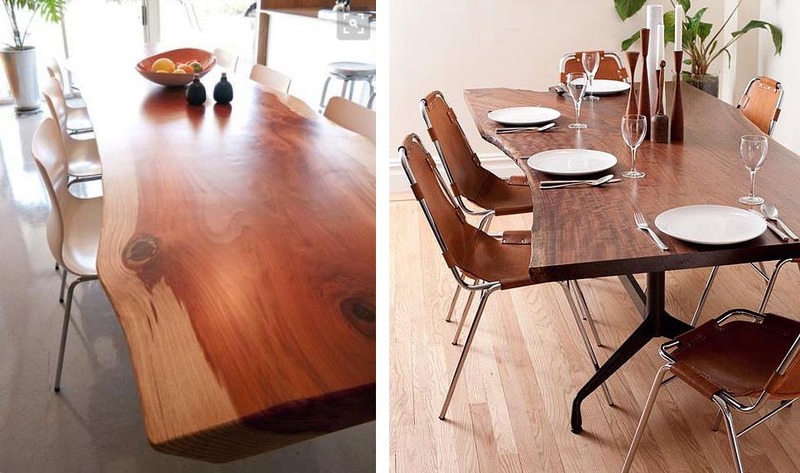 These tables belong to our BARKMAN Collection — Isn’t this just a gorgeous piece of wood turned into a live edge table. The beautiful soft finish turns the wood into a clean workable table top that will last for many years. 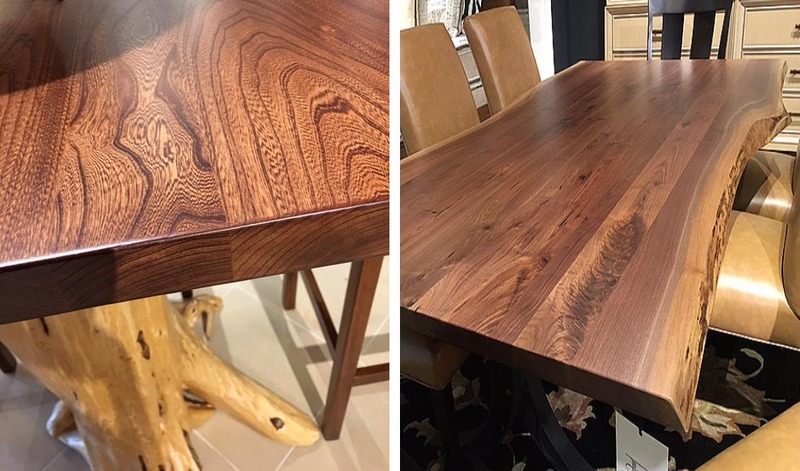 Both of these tables are available to see and touch in our showroom in Brookfield. That being said, LJE is offering a new collection of dining tables. Barkman live edge tables are made using sustainably-sourced, hand selected hardwoods, harvested in the American midwest forests. 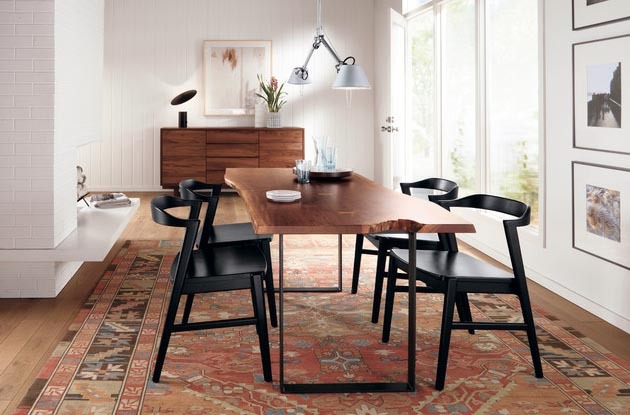 In this dining room you’ll find a blend of organic wood and contemporary elements…. this mix continues to be immensely popular. The craftsman who build these tables use time-honored joinery methods such as dovetailing, tongue-and-groove, box joints, and mortise and tenon – all of which of which offers a unique aesthetic appeal. Many still appreciate this kind of craftsmanship, or artistic sensibility. The most beautiful pieces of wood found, masterfully turned into furniture. These pieces have a focus on letting the natural beauty of the tree shine through and create the form. When is a chair not a chair? When it is a work of art. This furniture is created only from natural materials. But is this art? The workmanship is careful, precise, and appropriate. The lines, forms, and edges are true to concept and exact. The surface is impeccable. It is original in design and sculptural in form. The figure, color, and character of wood as a medium are handled with grace and integrity. The experience of touching delights the body and hand as the form, figure, color, and character delight the eye. They invested creativity, ingenuity, and imagination. And it is furniture that will last. White + Wood. Light + Dark. Love the clean contrast and warmth that always works well together. 1. You have choice about style and size. 2. Also choose a straight edge, plank styling, hand-planed or distressed finishes. 3. Barkman applies a perfect finish that enhances the natural beauty and provides optimal protection to ensure the wood develops beautifully into its patina tone with time. 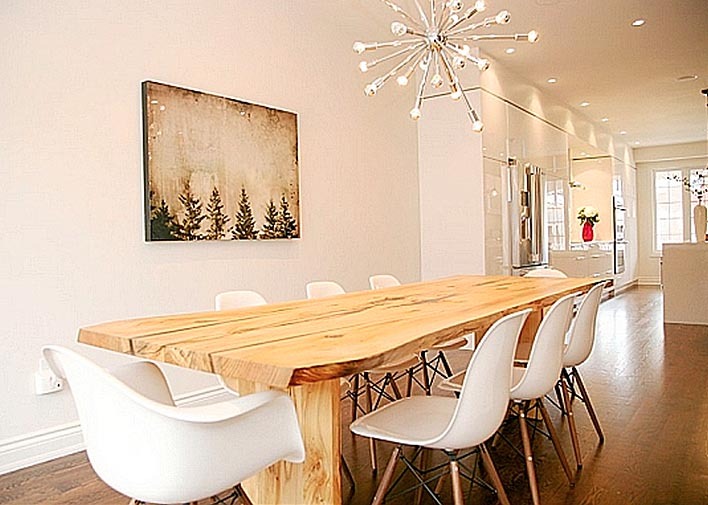 Live Edge table seems to adapt well in a traditional home dining room. Maybe a rug is not needed when the teal upholstered chairs help to visually separate the table from the floor. Incorporating natural materials such as wood or stone into your interiors is an easy way to be mindful of eco-friendly interiors. Whenever possible, look for artisan products. In addition to having a smaller carbon footprint than their mass-produced competitors, these products often have a longer lifespan. You can see from these dining rooms, how beautifully these rustic + modern tables mix into traditional settings, and all styles of chairs. Stop into our showroom to see the Barkman Collection, and ask a designer to tell you more about the custom options. This entry was posted in Uncategorized and tagged eco-friendly, live edge tables. Bookmark the permalink.